Recently auctioned by Biddle and Webb. 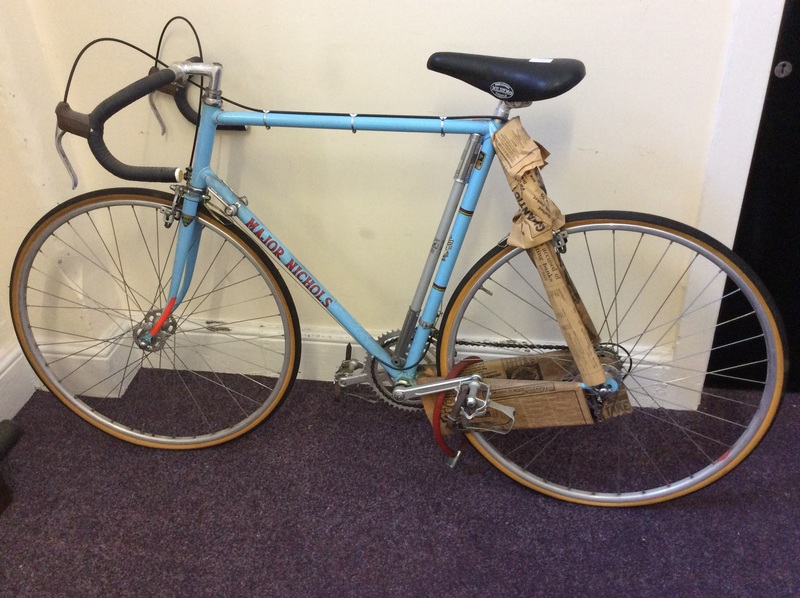 This is bike that has been well looked after and is in excellent condition in powder blue enamel. It was put away, from the evidence of the auction, as part of a collection of other similar aged bikes which were also sold. 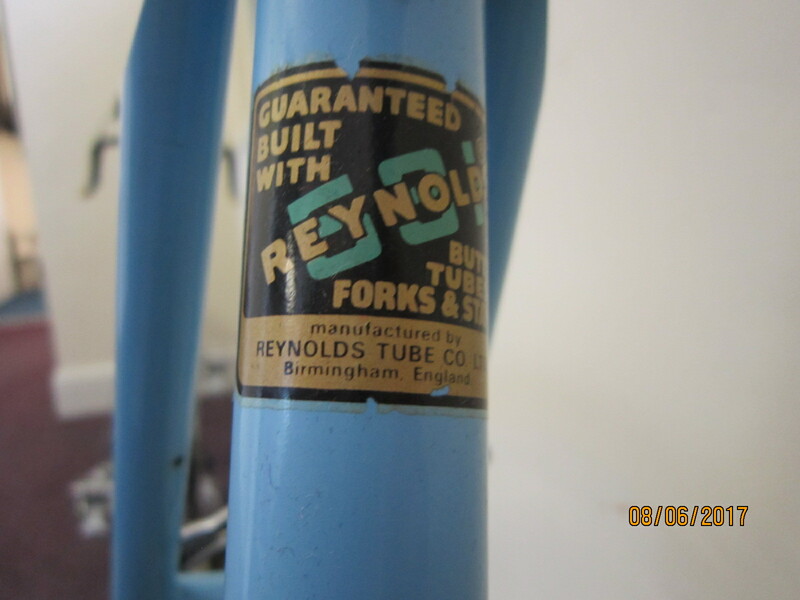 The frame was built circa 1979 and from the right period Reynolds fork decals we can say fairly certainly that it is in its original finish. The frame is built with Reynolds 531 double butted tubing on Prugnat S lugs. She has a short wheelbase and tight clearances including a short brake drop and pedal overlap which clearly indicate a competition TT bike built for a rider who knew what he wanted. The bottom bracket shell is not one I recognise but it is an attractive element. The seat-stay bridge is straight and reinforced, the stays are faired-in rather than a full wrapover and the topeyes are decorated with his double fishtail motif in white. 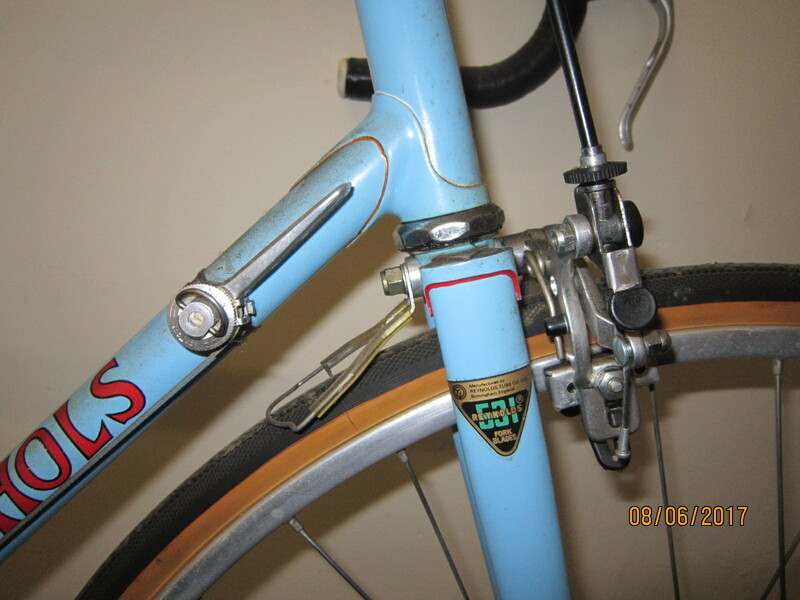 The rear dropouts are plain with a hanger and from an unknown maker. 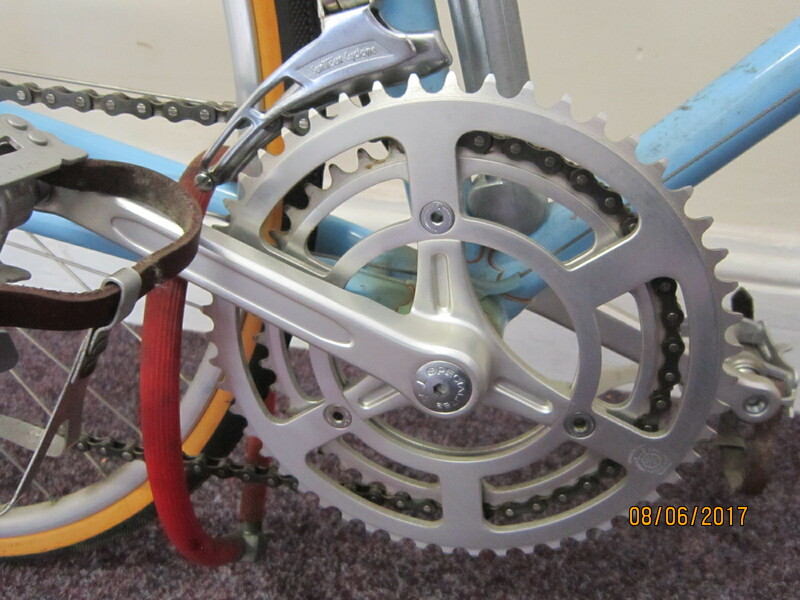 We would like a few more snaps to confirm the frame number and the chain-stay shape. The fork blades are a typical shape of the period but with little relief, thus shortening the wheelbase. They are built into a fork crown that I don’t recognise, possibly a refined and heavily modified flat topped Vagner No 11 with the chevron on the shoulder (losenge fraise’) utilising the top of the slot as the guide and reducing the need for cutting. Minimal braze ons in his 1960’s manner and ethos, giving maximum flexibility for the use of bar end or downtube shifters and maintaining tube strength. Just a front derailleur guide and stops for front and rear. Finished by Major in 1979 or possibly early 1980s in a single colour, powder blue with World Championship bands creating a panel for the Durban Road seat tube transfer. Unusually there is no head transfer. We are entering his era of shortage in the 1980’s perhaps. The lug lining is in red, white and gold. The topeye detail is in white. The Gothic script name transfers are in the contrasting red with a black edge option. 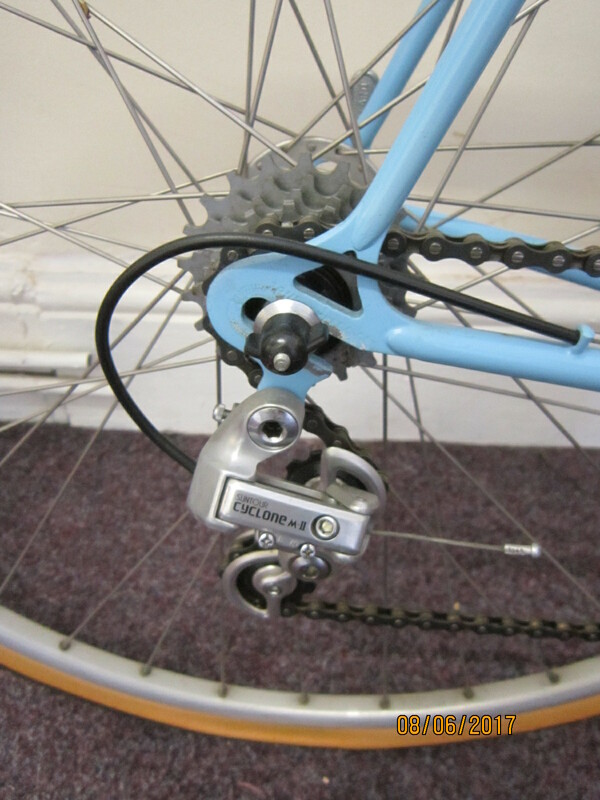 Suntour’s Cyclone II Derailleur’s began production in 1982. Nice sprint wheels, Fiamme rims on Campagnolo Record LF Hubs (I think) and a very nice 3 pin TA chainset and rings with Campagnolo pedals. 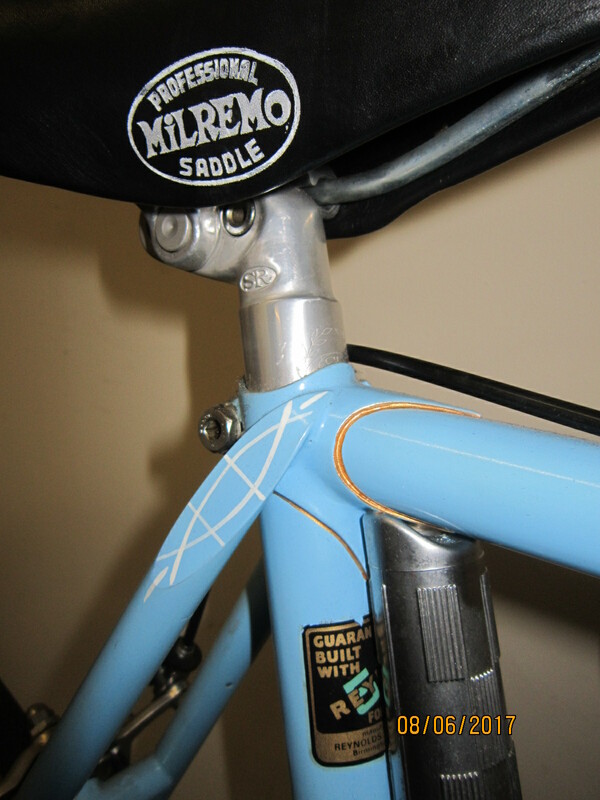 The Milremo Professional saddle is the first I have seen. We would love to hear from the new owner.